It is known that millimeter waves (MMW) are absorbed by surface tissue such as skin and the cornea. We previously demonstrated that MMW damages the eye by heat accumulation and transfer. To examine the influence of humidity on such damage, we investigated the difference in MMW-induced ocular tissue temperature increase under high (70%) and low (30%) relative humidity. 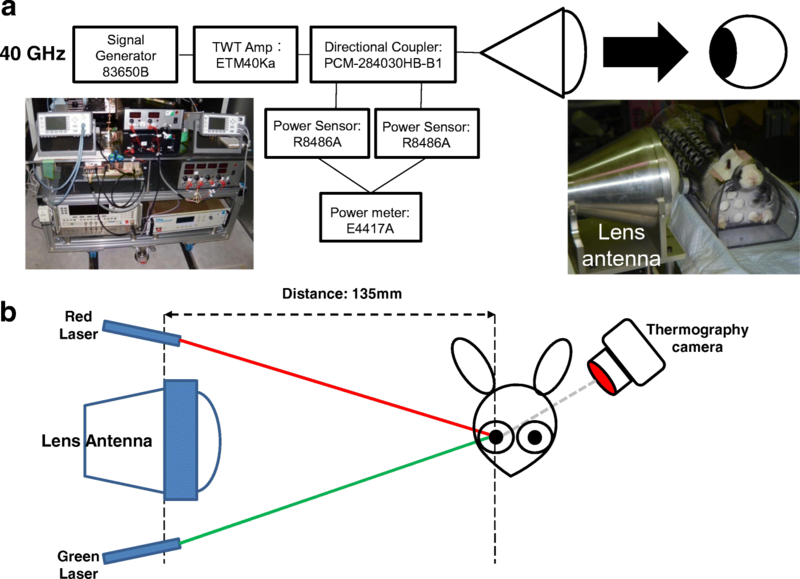 Eyes of pigmented rabbits (Dutch, 11–15-week old) were exposed unilaterally to 40-GHz 200 mW/cm2 MMW for 5 or 30 min at the center of the pupillary area with a spot-focus type lens antenna. Infrared thermography was used to measure corneal surface temperature during exposure. Temperature of corneal stroma and lens nucleus were measured using a fluoroptic thermometer during 0–30-min exposure. To visualize the dynamic change of temperature and its distribution in the anterior chamber, saline containing 0.2% microencapsulated thermochromic liquid crystal (MTLC) was injected into the eye anterior chamber. All three temperature measurements were much higher under high than low humidity at 24 °C room temperature and MTLC results showed the same trend during MMW exposure. These findings indicate that humidity affects MMW-induced ocular temperature elevation. We showed that low humidity during MMW exposure decreased heat accumulation and transfer, whereas high humidity increased the thermal effect. The present data demonstrated that controlling the environmental humidity might have an impact on ocular damage in eyes exposed to MMW. Masami Kojima and Cheng-Yu Tsai contributed equally to this work. 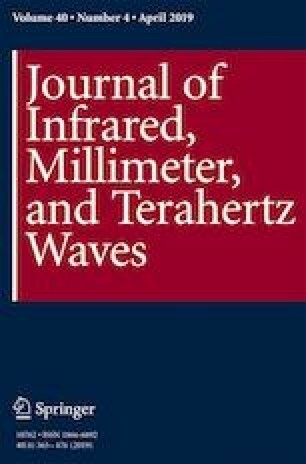 Millimeter waves (MMW) comprise energy in the frequency range 30 to 300 GHz of the electromagnetic spectrum. Over the past few decades, biological effects of MMW had only been investigated pertaining to their use in whole-body scanners at airports , radar systems (radio astronomy, police and military radar, vehicle collision prevention system) , and active denial systems (non-lethal weapons) . Recently, MMW have been gaining more attention with their increasing use in broadband wireless communications. Safety guidelines for MMW have been specified by the International Commission on Non-ionizing Radiation Protection  and the International Committee on Electromagnetic Safety (ICES) of the Institute of Electrical and Electromagnetic Engineers . Several studies have reported effects in the eyes by MMW exposure, but they mainly focused on surface tissue because of the shallow depth of penetration by radiation in this wavelength band [6, 7]. Safety issues regarding tissue surface heating from MMW exposure have also been reviewed . In addition, other recent studies have also reported acute effects from MMW exposure to the eye [9, 10, 11, 12]. Nowadays, the number of people working under MMW exposure has been increasing, yet there is a paucity of data on the potential biological effects of such exposure. Several studies of heat transfer in human eye have been published that inform evaluation of temperature distribution resulting from heat generation in eye tissues [13, 14, 15]. 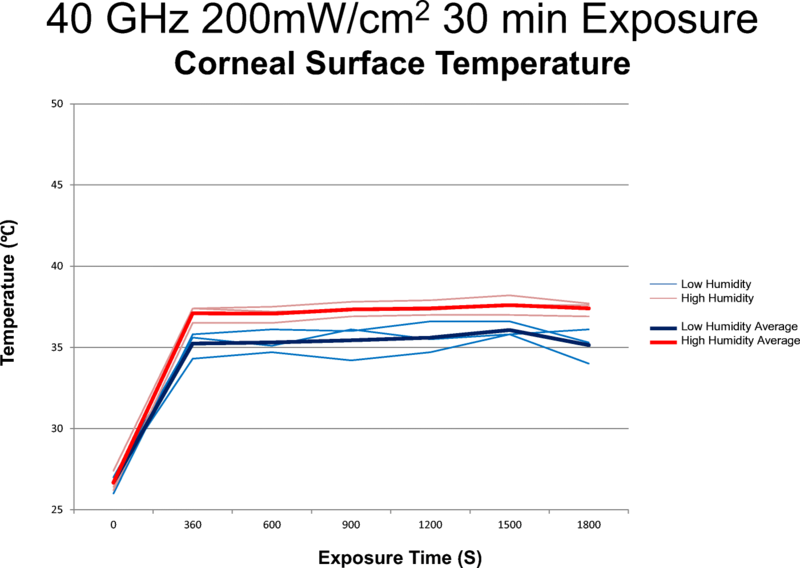 We previously reported that aqueous humor convection is an important factor in heat transfer from the cornea to the lens or vitreous humor . Moreover, our previous study suggested that not only heat transfer within the cornea but heat exchange between the cornea surface and ambient air plays an important role in corneal damage from MMW exposure . Therefore, the effect of ambient humidity, which may affect the rate of tear film evaporation, warrants investigation. Eyeball surface moisture providing lubrication in blinking and smoothening of the corneal surface to enable a clear view are maintained by a thin layer of tear film . Tear film is affected by ambient environmental conditions including humidity, temperature, and air flow [18, 19]. We investigated the effects of humidity on temperature elevation and transfer in eyes exposed to MMW and discussed the mechanisms underlying such ocular temperature elevation. A standardized exposure system for in vivo rabbit eye was established at 40, 75, and 95 GHz . Note that the frequency (40 GHz) was selected considering penetration depth into the eye. Briefly, the power source for 40-GHz continuous MMW comprised an 83650B signal generator (Agilent Technologies, Inc., Santa Clara, CA, USA) and a 40-W TWT amplifier (Ka Band, ETM Electromatic Inc., Newark, CA, USA). The MMW were transmitted through a conical horn antenna which had a 15-cm diameter lens to spot-focus the power localizing it to the eye . Power sensors monitored incident power to the antenna and reflected power from the antenna via a directional coupler to ensure the desired incident power density (Fig. 1a). Rabbit eyes were exposed to MMW with an incident power density of 200 mW/cm2 for 5 or 30 min at a distance of 135 mm from the lens antenna aperture to the corneal apex (Fig. 1b). The incident power density was defined as the spatially averaged incident power density over an area of 13-mm diameter, which approximates the average size of the rabbit corneal region (Pigmented rabbit, Dutch-belted). The center of the corneal surface was positioned in the line of maximum radiation from the antenna. The exposure point distance from the antenna surface to the corneal apex was determined by focusing red and green laser pointers on a target. After removal of the target, the apex of the rabbit’s cornea was positioned at the exposure point according to the method of Kojima et al. (Fig. 1b). All animal experiments were conducted in accordance with the Animal Study Guidelines of Kanazawa Medical University and the Association for Research in Vision and Ophthalmology Statement for the Use of Animals in Ophthalmic and Vision Research . Specific pathogen-free pigmented rabbits (N = 30, Dutch-belted, 12–15-week old, all males, average weight 1.87 ± 0.06 kg, range 1.75–1.99 kg, Sankyo Lab Service Co., Inc., Toyama, Japan) were exposed unilaterally to 200 mW/cm2 MMW for 5 or 30 min by lens antenna. Before exposure, eyes were examined by slit lamp microscopy (SL-130, Zeiss, Tokyo, Japan) to rule out presence of preexisting irregularities in the corneal surface and anterior segment. The pre-exposure examination included slit lamp images of the cornea, lens, and iris and fluorescent staining of corneal epithelium as described previously [10, 12, 16]. We exposed millimeter wave to one eye (right eye) and the other eye (left eye) was used as a non-exposed control. Medetomidine hydrochloride (0.8–1.0 mg/kg, Domitor®, Orion Corporation, Espoo, Finland) was injected intramuscularly to induce systemic anesthesia during exposure and ocular examination. A 2% lidocaine hydrochloride topical anesthetic (Xylocaine® 2%, AstraZeneca, Osaka, Japan) was administered prior to insertion of the thermo probes or injection of the micro-encapsulated thermos-chromic liquid crystal (MTLC) (Japan Capsular Products, Tokyo) into the anterior chamber before exposure. The upper and lower eyelids were held open with tape to prevent blinking during exposure. Saline drops, heated to 35–37 °C to minimize any influence on MMW-induced temperature change, were administered to eyes as necessary to prevent corneal epithelial cell damage by corneal desiccation. After the experiment, the rabbits were euthanized by pentobarbital sodium (81 mg/kg, Somnopentyl, Kyoritsu Seiyaku Corporation, Tokyo, Japan). Room temperature during MMW exposure was maintained at 24 ± 2 °C by an air conditioner. Relative humidity was controlled to achieve 30% or 70% by a humidifier and a dehumidifier. In this experiment, from the viewpoint of animal welfare, only the relative humidity was changed while the room temperature was fixed at 24 ± 2 °C. MTLCs are 20–30-μm sized particles which change color with temperature [21, 22, 23]. MTLCs display a variety of colors spanning the visible spectrum for a fixed temperature bandwidth. Through 35 to 45 °C, they display red at the lower temperature, passing through yellow then green (above 39 °C), then blue (42 °C), and finally purple at the higher temperature. Saline containing 0.2% MTLC was injected into the anterior chamber of the rabbit eyes with a 30-gauge (G) injection needle. A video camera was set at 90° to the slit lamp illumination to record aqueous humor convection and change of MTLC color in the anterior chamber. 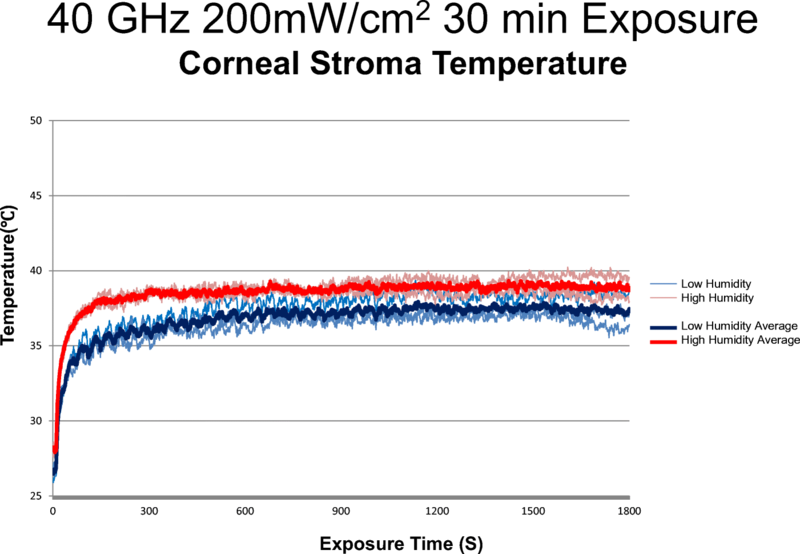 Corneal stroma and lens nucleus temperatures during MMW exposure were recorded with a fluoroptic thermometer (Luxtron 790, Luxtron Corporation, Santa Clara, CA, USA), as described [16, 24]. Briefly, the thermometer probes were inserted into the corneal stromal layer and lens nucleus, with the tip of each probe positioned at the center of the pupillary area after anesthesia. A slit-lamp microscope was used during insertion of the probes to ensure accurate positioning. Before starting to record, the topical anesthetic (heated to 35–37 °C) was instilled into the conjunctival sac, resulting in the corneal temperature dropping 1 or 2 °C. Once the corneal temperature had stabilized, MMW exposure was started. The rabbit eyes were unilaterally and sequentially exposed to 200 mW/cm2. An infrared camera (R300 Optional Lens, NEC Avio Infrared Technologies Co., Ltd., Tokyo, Japan) set above the rabbit eye recorded corneal surface temperature during exposure. Differences between outcomes of low (30%) and high humidity (70%) were analyzed using Student’s paired t test, taking p < 0.05 as statistically significant. R version 3.5.1  was used for the statistical analysis. Before performing Student’s paired t test, the assumption of normal distribution and equal variance of the data were tested by the Kolmogorov–Smirnov test and F test, respectively. All sets of sample data was proven suitable for the parametric test. Figure 2 shows MTLC color change in the anterior chamber during 40-GHz 200 mW/cm2 MMW exposure for 5 min under the two humidity conditions. After 30-s exposure, the upper part of the anterior chamber near the cornea side showed MTLC color change under high but not low humidity (Fig. 2a, e). Interesting results were obtained when exposure time reached 1 min; there was no color change under the low humidity environment (Fig. 2b), but two-thirds of the anterior chamber showed a marked color change which indicated a temperature of 38–40 °C under high humidity (Fig. 2f). After 2-min exposure, MTLC showed green (around 40 °C) in the upper part of the anterior chamber under low humidity (Fig. 2c). 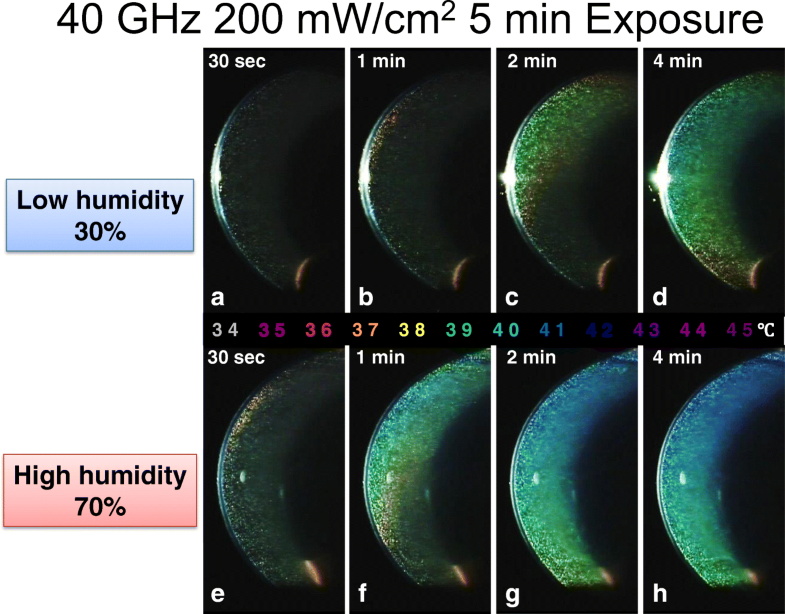 In contrast, the whole of the anterior chamber showed blue and green, indicating higher temperature (over 40 °C) under high humidity after 2-min exposure (Fig. 2g). At 4-min exposure, the temperature of the anterior chamber was increased under both humidity environments (Fig. 2d, h), especially under high humidity, which showed over 40 °C (blue color tone) in the whole anterior chamber (Fig. 2h). Temperatures of the corneal surface, corneal stroma, and lens during 200 mW/cm2 30-min exposure were all higher under the high (70%) than the low (30%) humidity environment (Figs. 3, 4, and 5). Soon after exposure onset, there was a steep temperature elevation at all three measurement sites. Under low humidity, the corneal surface temperature detected by thermography reached 35.5 °C whereas that under high humidity reached 37.3 °C (Fig. 3). Under low humidity, the corneal stroma temperature detected by fluoroptic thermometer reached 36.6 °C whereas that under high humidity reached 38.3 °C (Fig. 4), similarly those for the lens nucleus were 35.6 °C and 37.3 °C, respectively (Fig. 5), with the averaged three sites showing a significant difference in MMW-induced temperature elevation by humidity level (p < 0.05, Fig. 6). 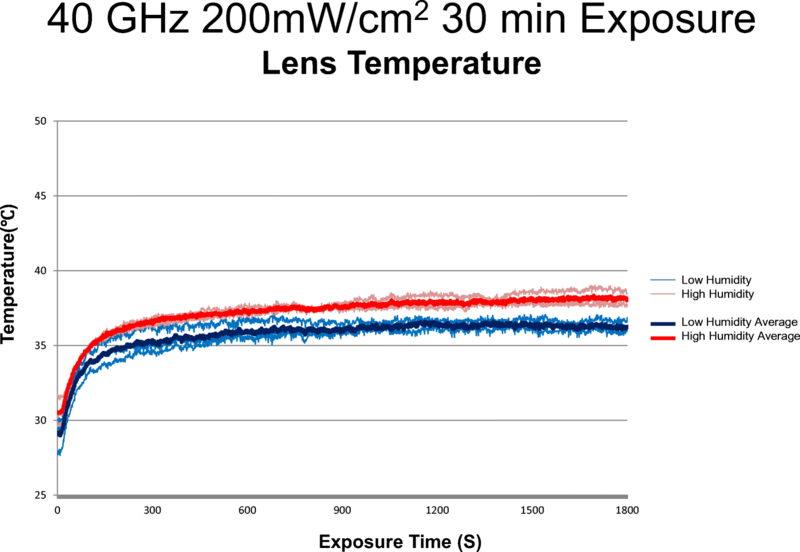 Thermal ocular effects from exposure to 35 and 107-GHz MMW have been reported . Karampatzakis et al. demonstrated by a computational approach using a 3D numerical model that aqueous humor flow in the anterior chamber plays an important role in heat transfer . 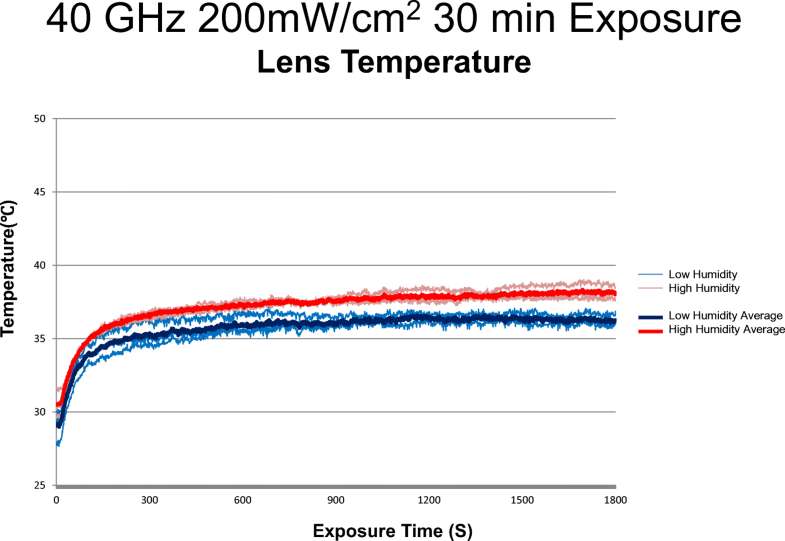 Another study showed thermal effects caused by MMW exposure not only in the cornea but in the lens . These reports suggested that the major effect of MMW exposure is heat accumulation, especially in the cornea. ICNIRP guidelines for high-frequency electromagnetic energy such as MMW indicate that the surface of the eye absorbs most of the energy of MMW irradiation , so we believe that energy absorption by the cornea is a very important issue. Our previous study indicated that we should assess thermal transfer in the eyeball with regard to the tear film layer on the cornea outer surface and aqueous humor convection within the anterior chamber [12, 16]. The cornea surface is covered by a thin tear film, which protects it from direct exposure to air. Tear film is the outermost surface element of the ocular system between the cornea and the outside environment. It plays an important role in optical function. Evaporation of aqueous tears has been studied as a major factor in tear film dynamics and may impact ocular temperature . Evaporation of tears is affected by temperature, air velocity, and relative humidity . The volume of evaporated tear loss ranges from 40 to 60% and is dependent on environmental conditions including relative humidity . Environmental factors have long been known to influence the tear film. Under environmental stress, such as low relative humidity or high air velocity, faster evaporation rates and thinning of the tear film predispose the cornea to dry spot formation, which may lead to dry eye symptoms and changes in the corneal epithelium [27, 28, 29, 30]. The purpose of the present study was to determine the relationship between relative humidity and ocular temperature change over a period of 5- or 30-min exposure to MMW. We investigated ocular temperature change to elucidate potential risks of ocular damage due to different evaporation rates under different relative humidity environments. 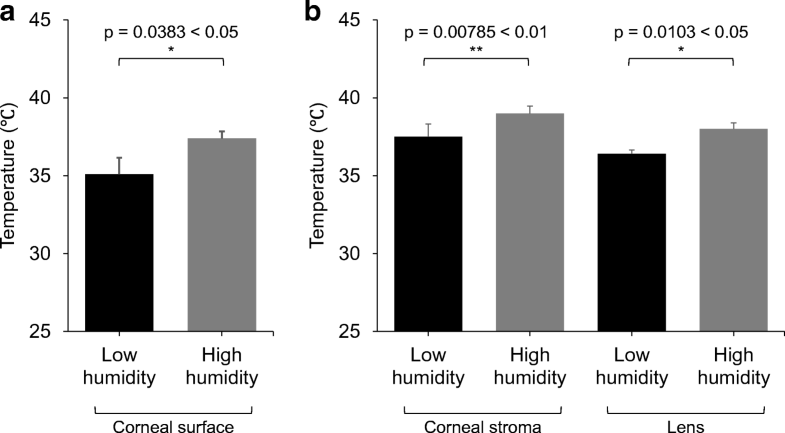 In this study, statistically significant increases in temperature occurred at the corneal surface, corneal stroma, and lens nucleus by exposure to MMW under a high humidity environment. It has been reported that transpiration rate from the corneal surface decreases by 20–25% when 30% humidity increases to 40% . Abusharha and Pearce reported that tear film evaporation rate significantly increased with exposure to a dry environment . From these findings, we can deduce that humid environments have an important impact on tear film evaporation rate. Since heat accumulated on the surface of the eye during MMW exposure, we suggest that a low evaporation rate might increase the thermal effect during MMW exposure. This temperature change under a high humidity (70%) environment could explain the evaporation effect during MMW exposure. Ocular symptoms including itch, burning sensation, and dry eye are commonly reported by individuals working in closed and dry environmental conditions, which are characterized by low humidity [33, 34]. Although low humidity might cause ocular surface symptoms, our data indicated that with the increase in tear evaporation, corneal surface temperature decreased because of dissipation of the heat. It is clear from this study that controlling the humidity, with for example a humidifier, may decrease the tear film heat evaporation within MMW exposure guidelines. The present study demonstrated a significant difference in MMW-induced temperature change by humidity environment. The exact mechanisms of this outcome remain unclear. It is likely that an increase in humidity results in a decrease in tear film evaporation, such that some heat induced by MMW exposure accumulates in the eye. Conversely, reduction in humidity is likely to cause an increase in tear evaporation, such that some heat induced by MMW exposure is lost to tear film evaporation. Let us consider the contribution of relative humidity to temperature elevation at the corneal surface during exposure to over 40 GHz MMW. We expect that the contribution will increase with decreasing depth of penetration of MMW into the eye. While MMW penetrate the anterior chamber at 40 GHz, the penetration depth decreases with increasing frequency [35, 36]. Thus, the variation in temperature elevation by relative humidity is expected to increase at frequencies above 40 GHz. We demonstrated that humidity affects ocular temperature elevation that is induced by MMW exposure. Going forwards, we should consider environmental factors, especially relative humidity, during MMW exposure. The effect of relative humidity on ocular temperature rise during MMW exposure was investigated. It was shown that ocular temperature was significantly elevated under high than low humidity. MTLC data indicated that there is greater heat transfer to intraocular regions under MMW exposure in a high (70%) than low (30%) humidity environment. It was demonstrated that environment humidity is an important factor in heat transfer in eyes exposed to MMW. Controlling humidity may have a great impact on ocular effects of MMW exposure. This work was supported by Ministry of Internal Affairs and Communications, Japan. The authors declare that they have no conflict of interest. The authors are indebted to Dr. Taiji Sakai, Ms. Yoko Yamashiro, Dr. Nailia Hasanova, and Ms. Mari Seto for their technical assistance, and to Mr. David Price for English proofreading. ARVO Statement for the Use of Animals in Ophthalmic and Vision Research https://www.arvo.org/About/policies/statement-for-the-use-of-animals-in-ophthalmic-and-vision-research/. Accessed 7 June 2018. R Core Team, "R: A Language and Environment for Statistical Computing," R Foundation for Statistical Computing, Vienna, 2018. https://www.R-project.org. Accessed 20 December 2018.